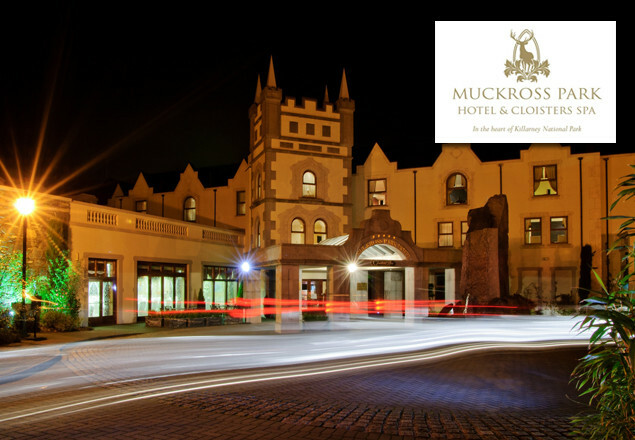 A 1 night luxurious stay for two people at the 5* Muckross Park Hotel & Cloisters Spa, Killarney, Co. Kerry. With this exclusive offer from Rewarding Times you get to enjoy a magical overnight stay at the 5 star Muckross Park Hotel & Cloisters Spa. This offer includes a stay in a King Deluxe room with full Irish Buffet Breakfast the next morning, a two course dinner in Molly Darcy's Traditional Irish Pub, a guided walking tour of Killarney National Park and two €25 vouchers off a massage or facial at the award winning Cloisters Spa. The Muckross Park Hotel & Cloisters Spa is located in the heart of Killarney National Park with a mix of traditional Muckross hospitality and modern deluxe facilities. The hotel first opened its doors in 1795 as The Herbert Arms and was part of the original Muckross Estate. The hotel boasts the award winning Cloisters Spa offering a range of beauty treatments and massages. The Spa uses Aromatherapy Associates products as well as Spanish Skin care specialist Germaine de Capucini. The Vitality Pool and Thermal Suite is a haven of relaxation with a large hydro therapy pool, Herbal Steam Room, Caribbean Rainshower, Ice Fountain, Salt Grotto and Canadian Style Outdoor hot tub. All of this overlooking the Blue Pool River in the heart of Killarney National Park. Guests can dine in the renowned Molly Darcy’s Traditional Irish Pub, one of Killarney’s land mark pubs. Noted for its gastro Irish pub menu, great service and entertainment, this is an experience in keeping with traditional Irish hospitality. GB Shaw’s is the hotels main restaurant and serves the best in 28 day aged beef in Kerry. With seafood sourced from the wild Atlantic Ocean, Poultry from Ballinskelligs and hand made local ingredients, GB Shaw’s is a noted dining location and also a recent winner of an AA Rosette. Famous past guests include George Bernard Shaw who spent the summer of 1913 here and was also said to have written part of Pygmalion (My Fair Lady) here. In August 1861 Queen Victoria visited Killarney and stayed at Muckross House just across the road from the hotel and she took lunch in the hotel on Wednesday 28th August. Daniel O'Connell used the hotel to rest and have a glass of 'toddie' during his many journeys from his home in Caherdaniel en route to Westminster with the Bianconi Coach. During your stay the Guest Relations Team would be happy to arrange activities for you such as a round of golf in any of the 7 championship golf courses close by or perhaps a tour of the Dingle Peninsula or Ring of Kerry. The hotel is at the heart of the best that Kerry can offer. The current owners Bill Cullen and Jackie Lavin took over the hotel in 1990 and over the years have carefully created the impressive 5 star hotel in place today. Muckross Park Hotel & Cloisters Spa – hospitality by nature. 2 course dinner for two in Molly Darcy's Traditional Irish Pub. Access to the Vitality Pool & Thermal Suite in Cloisters Spa for both guests throughout your stay. Free bike hire from the hotel. Free access to the Cloisters Spa gym, Free WiFi access and Valet Parking. Hotel is closed midweek December, January & February. Price is for two people sharing for one night. Reservations are essential. Please call the hotel on +353 (0) 64 6623400 to reserve.